Ann Marie Thomas, Author: Intruders is Published! After more years than I care to remember, Intruders is finally available as an ebook and in print. I know it's very bad writing, but I want to use lots of exclamation marks because I'm so excited!!! The ebook is available now on Amazon for £2.07, but if you wait until Tuesday it will be free til Sunday. The reason I'm giving it away is to get lots of downloads and hopefully, reviews. After that it will be 99p and eventually rise to £1.99. The print book, 300 pages, is available on Create Space, for £8.99, and will appear on Amazon in the next few days. Tabitha Enns is given work experience on board the Kestrel, on the adventure of her life, that will push her to the limit. Tabitha gets to meet her first aliens, but it doesn't go smoothly, and being out in space isn't what she expected. 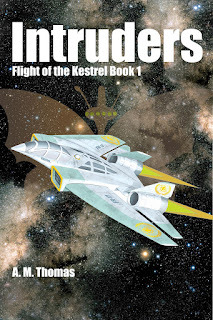 When a hostile alien species are discovered, the Kestrel is sent to make contact, leading the crew – and Tabitha – into danger, and the crew have problems with their friends as well as their enemies. Why did a dying man say, 'butterfly'? Who exactly is the mysterious injured woman, and what is her connection to the hostile aliens threatening not only the Kestrel's crew but the entire galaxy? I hope you've enjoyed the book so far as I've been blogging every week, I hope you'll go and get the whole thing. And when you've read it, I hope you'll leave an honest review on Amazon.